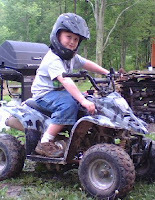 With the snow here in full force, Michael is missing his four wheeling jaunts at Nanny and PaPaw's house. Only six more months to go sweetheart! I'm having a hard time letting go of fall. Maybe that's why we have holidays to distract us into another season.